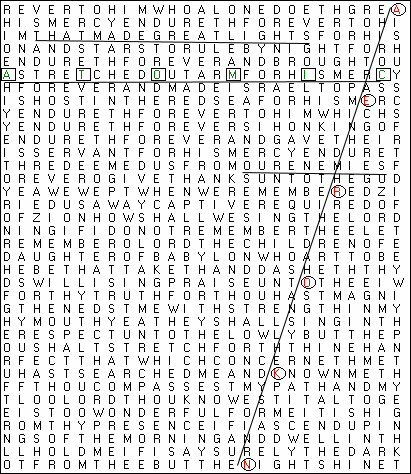 The "Bible Code" is a way of looking for hidden prophecies and passages in the Bible, by using a software program to search for messages in the Old Testament Hebrew text. The spaces between words are eliminated, so that the Old Testament is a continuous block of Hebrew letters. Then, by skipping letters at a programmed interval, the program searches for words. 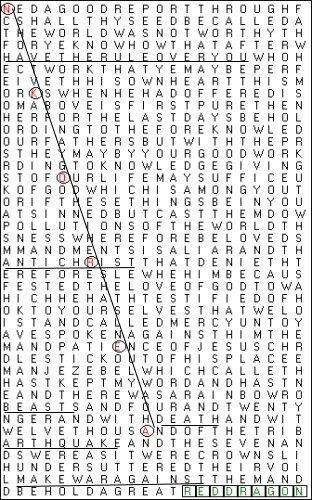 There appear to be patterns to the passages where the words are found, and what words are clustered together. And on this site I show that the Bible Code also works in English in the King James Bible. By using Bible code software I searched for some words in the King James New Testament and Old Testament (separately). 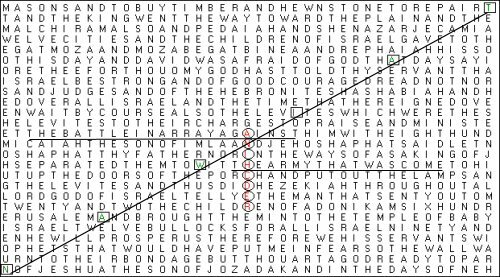 I found that there is evidence of English Bible code patterns that the software found by skipping varying intervals, in the King James Old Testament or New Testament, made into a block of solid text. On this page I show matrices on: the possibility of a North Korea land and/or missile attack on South Korea and/or Japan or the United States. Also note other relevant words and phrases in this matrix that I have underlined: THE ARMY THAT WAS COME, THE BATTLE IN ARRAY AGAINST. But this could be about the Chinese Civil War in the past. Its hard to say what it is about. And also in this matrix is: THAT MADE GREAT LIGHTS (which could here be about a North Korea atomic bomb going off), OUR ENEMIES. So this could be about North Korea setting off nuclear weapons. -- RED DRAGON (North Korea, Russia, and/or China may be the angry Red Dragon in Revelation 12, who also represents Satan thrown down to earth).